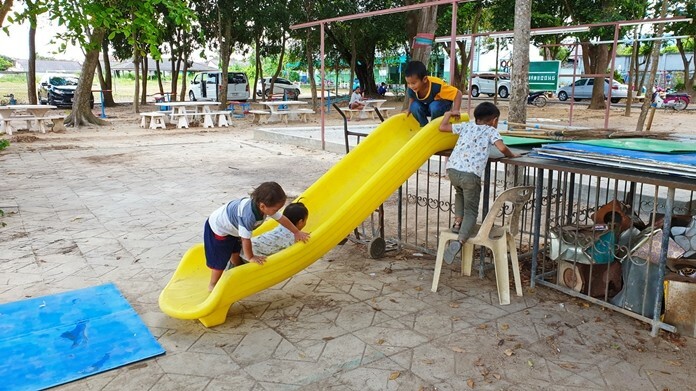 Students and parents have fixed up a Sattahip playground with recycled materials that, although non-standard, have brought fun and smiles to the faces of little children. Students and parents have fixed up a Sattahip playground with recycled materials that, although non-standard, have brought smiles to the faces of little children. A slide and other playground equipment have been added to existing steel-frame equipment at Kledkaew School. The plastic parts were discarded by others and repurposed to fill in gaps at the small and broken-down playground. Some parents expressed concern, however, that the recycled parts do not meet safety standards and asked authorities to inspect the gear to ensure children will not be injured.